This study describes our experiences with a 44-year-old woman who developed acute type B aortic dissection and elected emergency surgery 3 years after a renal transplant. This led to acute ischemia in the right lower extremity. The first stage of surgery was to implant an extra-anatomic (pretracheal) bypass with a GORE-TEX prosthesis from the brachiocephalic trunk to the left common carotid artery. The second stage was implanting a stent graft into the aortic arch that covered the left common carotid artery and the left subclavian artery. The third stage was to insert a stent graft that involved the entire thoracic aorta and proximal segment of the abdominal aorta to the celiac trunk, with the right axillary and left femoral approach. The fourth stage was an extra-anatomic (suprapubic) bypass with the GORE-TEX prosthesis from the left femoral artery to the right femoral artery. Surgery resulted in normal blood supply to the organs and restored renal function. Thoracic aortic aneurysms affect 10 of every 100 000 elderly adults.1 Type B (“distal”) aortic dissections (according to Dailey classification) continue to be a major medical problem.2 In 70% of all cases, the dissection involves the ascending aorta. This is referred to as type A (“proximal”) aortic dissection and requires immediate cardiac surgery because of the risk of aortic rupture and a mortality rate of 100%.2,3 Type B aortic dissection occurs in 30% of all cases and usually responds to conservative treatment involving blood pressure control and lowering of the heart rate.4,5 The mortality rate in distal aortic dissections is approximately 10%.6-8 If the aortic dissection is complicated, with acute visceral or limb ischemia, or aortic rupture, surgery is essential and indicated.2,4,5 Mortality in the presence of these complications rises to 30%. Aortic dissection is diagnosed using computed tomography angiography. The ultimate goals of endovascular surgery, introduced by Parodi in 1991, are to close the entry and re-entry tears of the dissection and to restore normal blood flow in the true aortic lumen.7,9,10 It leads to the collapse of the false lumen, and a final partial or complete false lumen thrombosis.11 Most entry tears are located at the origin of the left subclavian artery. The closest section of healthy aorta is located above the tear; therefore, stent graft implantation within the aortic arch often (in approximately 25% of cases) requires covering the left common carotid and subclavian arteries. In rare cases, the endovascular prosthesis must be implanted within the aortic arch to cover the brachiocephalic trunk (innominate artery) as well. Such management requires surgical preparation of the aortic arch by extra-anatomic bypass, enabling covering the aortic arch using the stent graft. This is referred to as a hybrid approach, involving bypassing of the arteries arising from the aortic arch during an open surgery after implanting an endovascular stent graft.10 The endovascular technique interferes with the basic mechanism leading to aortic dissection, as it initiates the natural repair processes: false lumen thrombosis.12 As a result of covering the entry, false lumen blood flow pressure decreases. In 2009, a 44-year-old woman with a renal transplant from a deceased donor in 2006 who was on an immunosuppressive regimen (ie, tacrolimus, sirolimus, and prednisolone) was admitted to the vascular surgery department of our hospital with symptoms of acute type B aortic dissection (according to the Stanford Classification) that was confirmed using computed tomography angiography. Dissection involved the left subclavian artery and continued spirally through the thoracic descending aorta, to the abdominal aorta, involving the celiac trunk and superior mesenteric artery, and the iliac and femoral arteries. This led to acute right lower limb ischemia. Because of reported thoracic pain, symptoms of acute ischemia involving the right lower extremity and increasing renal failure of the transplanted kidney, the patient was selected for emergency surgery. 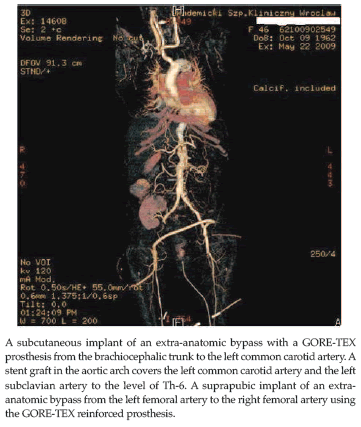 The first stage of the surgery involved an extra-anatomic bypass with a reinforced, heparin-bonded, GORE-TEX (W. L. Gore & Associates, Inc., Newark, DE, USA) prosthesis surrounding the brachiocephalic trunk to the left common carotid artery. We performed a subcutaneous implantation of a pretracheal vascular graft. Then, we implanted a stent graft into the aortic arch, covering the left common carotid artery and the left subclavian artery. The stent graft covered half of the descending thoracic aorta to the level of Th-6. Because of progression of dissection of the thoracic aorta and the critical narrowing of the true lumen, we extended the surgery by implanting the next stent graft module, which involved the entire thoracic aorta and proximal segment of the abdominal aorta to the celiac trunk, using the right axillary and left femoral approach. The endovascular fenestration of the abdominal aortic segment was performed simultaneously. Because of the critical ischemia of the right lower extremity (rest pain) that was caused by occlusion of the left iliac artery, with the false lumen of dissection, we implanted an extra-anatomic bypass (with suprapubic crossover) from the left femoral artery to the right femoral artery, using the GORE-TEX–reinforced prosthesis (Figure 1). After surgery, blood to the right lower extremity improved, and blood supply was normal to the abdominal organs. Blood from the true lumen to the transplanted kidney in the right iliac fossa was seen, and renal function was normal. When choosing endovascular treatment of type B aortic dissection, implantation criteria must be fulfilled, determining treatment success. In acute type B aortic dissections, open surgery may be necessary to lengthen the neck of the dissecting the aneurysm, transposing the left carotid artery to the right carotid artery, or performing in extra-anatomic bypass from the brachiocephalic trunk to the left common carotid artery. Clinicians may band the left common carotid artery to exclude potential endoleaks after implanting the stent graft. In our case, despite implanting the stent graft into the aortic arch and thoracic descending aorta, subsequent progression of dissection in the abdominal aorta, the major widening of the false lumen—we observed an impaired blood supply to the abdominal organs and transplanted kidney. As symptoms of impaired blood flow to the abdominal organs, transplanted kidney, and right lower extremity increased, we performed an implantation of the stent graft module to obliterate the false lumen and improve the blood supply to the abdominal organs and transplanted kidney. The next telescopic stent graft was implanted between Th-6 and the celiac trunk. Fenestration was done in the abdominal aorta, improving blood flow to the celiac arteries, and the renal artery of the transplanted kidney. Perfusion of the transplanted kidney improved, with greater improvement in function. Improved blood supply to the abdominal organs also was seen. Because the right external iliac artery was obliterated by dissecting, and considering the associated thrombosis, we performed a femorofemoral suprapubic bypass. This bypass improved blood supply to the right lower limb.14,15 This case illustrates a new treatment option of acute type B aortic dissection (involving the thoracic and abdominal aorta) in patients after a renal transplant, and the complications that may occur in this dangerous large vessel pathology. Increased risk of acute aortic dissection should be considered in patients with a renal transplant, with chronic immunosuppression, and poorly controlled hypertension. The hybrid approach for treatment of Stanford type B aortic dissection in patients with a renal transplant decreases mortality and postoperative morbidity. This approach results in maintenance of normal graft function. Bavaria JE, Appoo JJ, Makaroun MS, et al. Endovascular stent grafting versus open surgical repair of descending thoracic aortic aneurysms in low-risk patients: a multicenter comparative trial. J Thorac Cardiovasc Surg. 2007;133(2):369-377. Atkins MD Jr, Black JH 3rd, Cambria RP. Aortic dissection: perspectives in the era of stent graft repair. J Vasc Surg. 2006; (suppl 43 A):30A-43A. Song TK, Donayre CE, Walot I, et al. Endograft exclusion of acute and chronic descending thoracic aortic dissections. J Vasc Surg. 2006;43(2):247-258. Schoder M, Czerny M, Cejna M, et al. Endovascular repair of acute type B aortic dissection: long-term follow-up of true and false lumen diameter changes. Ann Thorac Surg. 2007;83(3):1059-1066. Eggebrecht H, Herold U, Kuhnt O, et al. Endovascular stent-graft treatment of aortic dissection: determinants of post-interventional outcome. Eur Heart J. 2005;26(5):489-497. Estrera AL, Miller CC, Goodrick J, et al. Update on outcomes of acute type B aortic dissection. Ann Thorac Surg. 2007;83(2):S842-S845; discussion S846-S850. Eggebrecht H, Nienaber CA, Neuhäuser M, et al. Endovascular stent-graft placement in aortic dissection: a meta-analysis. Eur Heart J. 2006;27(4):489-498. Böckler D, Schumacher H, Ganten M, et al. Complications after endovascular repair of acute symptomatic and chronic expanding Stanford type B aortic dissections. J Thorac Cardiovasc Surg. 2006;132(2):361-368. Xu SD, Huang FJ, Yang JF, et al. Endovascular repair of acute type B aortic dissection: early and mid-term results. J Vasc Surg. 2006;43(6):1090-1095. Zhou W, Reardon M, Peden EK, Lin PH, Lumsden AB. Hybrid approach to complex thoracic aortic aneurysms in high-risk patients: surgical challenges and clinical outcomes. J Vasc Surg. 2006;44(4):688-693. Gaxotte V, Thony F, Rousseau H, et al. Midterm results of aortic diameter outcomes after thoracic stent-graft implantation for aortic dissection: a multicenter study. J Endovasc Ther. 2006;13(2):127-138. Dialetto G, Covino FE, Scognamiglio G, et al. Treatment of type B aortic dissection: endoluminal repair or conventional medical therapy? Eur J Cardiothorac Surg. 2005;27(5):826-830. Czerny M, Gottardi R, Zimpfer D, et al. Mid-term results of supraaortic transpositions for extended endovascular repair of aortic arch pathologies. Eur J Cardiothorac Surg. 2007;31(4):623-627. Henke PK, Williams DM, Upchurch GR Jr, et al. Acute limb ischemia associated with type B aortic dissection: clinical relevance and therapy. Surgery. 2006;140(4):532-539; discussion 539-540. Yamaguchi M, Sugimoto K, Tsuji Y. Percutaneous balloon fenestration and stent placement for lower limb ischemia complicated with type B aortic dissection. Radiat Med. 2006;24(3):233-237. Acknowledgements: The authors certify that they did not receive any support (eg, grants, funding, payment, or other benefits) in connection with the preparation of this manuscript.The authors certify that they have no conflicts of interest with any financial organization regarding this manuscript.